With passionate activism, the Venus Star of Aries rides into our lives, sounding the horn, awakening the troops, rousing the masses, and calling forth action in a determined way. The pattern for the Morning Star (warrior-like) and Aries (co-ruled by warrior Mars) is not simply a metaphor. Every four years when the Aries Star occurs, there is a highly explosive event that rocks our equilibrium. These Aries VSP periods are times when terrorists, bombers and bullies explode on the scene. It’s also the time of super-heroes. We will need them as the Aries Star Point period of 2017 highlights the ongoing meeting of Uranus and Eris, also in that sign. The Venus Retrograde approximates 40 days. It occurs every 1.6 years. Last one was July-August 2015. This one is Mar-Apr 2017. Next one is Oct-Nov 2018. Think of these periods as a bubble of time encompassing or containing a certain type of energy directive within each one, like the birth of a fiery new being delivered by Venus straight to your doorstep. In other words, now is the time to bring to completion or renewal the activities begun in August 2015. And, as we begin anew now, think of the next timeline of Oct 2018 when that will be brought to completion or renewal. For the better part of this new year, 2017, the goddess/planet we named Venus resides in Aries (February 3rd until June 5th). Her average time in a sign when she’s not involved in her retrograde cycle, is approximately one month. So this gives anybody and everybody with planets in Aries a chance to have Venus shower them with her high potency energy. And her grace. The high point of the cycle? March 25th when Earth, Venus and Sun are aligned in a laser-beam like energy that both provokes and invites. That is the date of the next Star Point at the astrological degree of 5 Aries (4’57”). But as she dips back into Pisces for a bit, changing both signs and directions, we might want to review the decisions we’ve made. How do we really feel? Confused? Probably until mid-May when a forward-moving Venus in fast-paced Aries, beyond the shadow of her retrograde marches forward, crystal clear about the direction of her passionate activism, her new life calling. The Venus Retrograde itself is a life review and it is especially directed around contracts or marriages (7th H) regarding assets or resources (2nd). Those two houses form a quincunx relationship which requires constant adjustment to stay balanced. Neglecting the adjustments that are required to achieve balance in this area could very well lead to collapse if not transformed in some way. New life is waiting on the other side, after Venus turns direct. But before it gets back into Aries where lies all the momentum to move forward, she lingers in the last degrees of Pisces through late April. Don’t respond to the temptation of falling back into victim hood at that time by stepping back into old patterns that control, demoralize or devalue your offerings . Athena’s energy is deeply involved with this Aries Star Point. She brings wisdom and strategy, strength and courage to act and protection to defend. Use it. What is the Venus Star message in Aries? One of the five points of the transiting Star of Venus has been Aries since 1929. She will continue to pass through Aries until 2038. Each time the Star Point activates Aries (every 4 years for a nine-month period), we collectively experience a JOLT, a lightning-like wake-up call to begin something new and awaken sleeping tigers. The dynamic awakening force is administered, somewhat as if we’ve all just had a high energy drink. The challenge facing us during this period is to remain calm in the face of the storm. Everywhere we turn we find ourselves liable to be provoked by something outrageous that has been said or done which can arouse fury. During the retrograde we are cautioned to temper the response, pull in and actively engage in peaceful presence and response, rather than shouting back with the same intensity. Passionate activism, fueled by Venus, arises from the heart. When connected to this process, during Venus’ closest approach to the Earth, we might be able to pause the angry, hyper-active mind and get our message from the heart. Will that be easy to achieve during an Aries Morning Star period? Not easily achieved, because there is so much reactivity and quick, shoot-from-the-hip response. That is to be expected when such threatening possibilities provoke so much fear. But, by the latter part of the Venus Rx, between April 15 and May 7, we are able to maintain firm ground in a new course of action. And, following May 21 when Venus actually clears the retrograde shadow begun in January. Aries is not usually a passive nor a relaxed and easy-going sign. In the last 88 years since the inception of the Aries Star Point, there are typically violent and angry responses to what is going on in the bigger picture. And, people who are born with the Aries Venus Star Point usually turn out to be activists of some kind. They are out-spoken and direct and can easily become coaches and advocates that raise their voices to speak for the silent masses who either cannot or choose to do not. That’s also because the Aries VSPs have the courage to speak up and say something. Where others tremble in fear of reprisal, the Aries warrior-self jumps into the fire. The Aries experience involves the act of being here to arouse, provoke, issue a wake-up call and ultimately call b-s on the status quo. They can be the most courageous heroes of our times, risking their own lives to save others. During this coming Aries Star Point phase we will feel this extreme hyper-activism played out all around us. But the true gift of the retrograde period of Venus is to be the calm in the center of the storm. That doesn’t mean go comatose. It means be alert to what’s happening and keep the energy moving in a constructive way. Just because we may not like the current energy dynamic doesn’t mean we can’t do something about it. About retrogrades, I will quote from Pia Orleane, co-author of The Divine Feminine to be published by Bear & Co. It is worth noting that the Venus Star clock, shown below, always moves in a retrograde (clockwise) position around the wheel. This Star Point activation of Aries refuses to take “no” for an answer. In Mythic Astrology, which was published some years ago (just recently available in e-book and Kindle) we likened Aries to the hero Jason and to the goddess Athena. Check this story out, written almost 3,000 years ago and see how the mythic archetypes play out over and over again: young Jason is given an enormous task, to retrieve the golden fleece and restore his kingdom to order after a brash usurper has taken control! With stamina, fortitude and faith, Jason, with a little help from his friends, the Argonauts, gets the job done.The warrior of Aries is Mars, its traditional ruler. He acts as both soldier, conqueror and hero. Think of Mars as a mix between Jason, who with his team of companions builds an incredible ship (the Argo) to make this journey, and the primal, instinctual drives that Aries possesses to soldier on and refuse to accept defeat, no matter what. This Venus Rx and Star point puts Athena front stage and center. First, a Morning Star Venus is closer in nature to Athena than she is to Venus and second, she is a co-ruler of Aries. She is the warrior’s strategist and voice of wisdom. Look closely at the advice that is given from Athena. To make best use of her energy, stay grounded, put your shield up, protect yourself and your assets (this first came up as “asses”, but it’s “assets”) so take steps to review and protect both of them in this cycle. Also, Athena is no victim. She is the warrior goddess, coaching us to stand up for what is right. Passionate Activism coming through this newly birthed Venus Morning Star in Aries suggests that when we are moved deeply to respond to something, there’s no holding back. 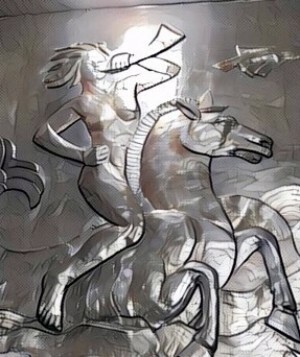 Athena is the warrior goddess, but think of her not as the one out there on the battle ground, but rather the one who possesses the wisdom as strategist to preserve the nation-state in its highest order. 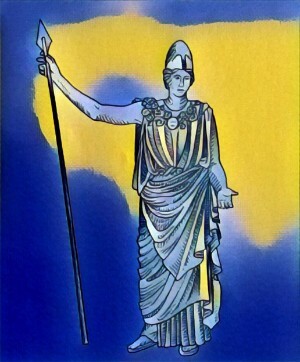 Pallas Athena can bring peaceful negotiations to the table. I also like to think of Venus gracing Aries with the idea that there’s a new chapter opening on the heart center. A new cycle beginning for those in relationship. In Aries, it’s the type of energy to go after what you want. Whether it’s making a gesture toward someone new or jump-starting new life into a relationship that’s been getting stagnant and stale for awhile, it’s certainly time to take the leap or the next step in setting a new precedent. The Venus Star pattern is intricately and dynamically engineered, like a fine Swiss clock. There are a number of cycles within cycles that this clock depicts, but for the purpose intended here, the pattern is below. 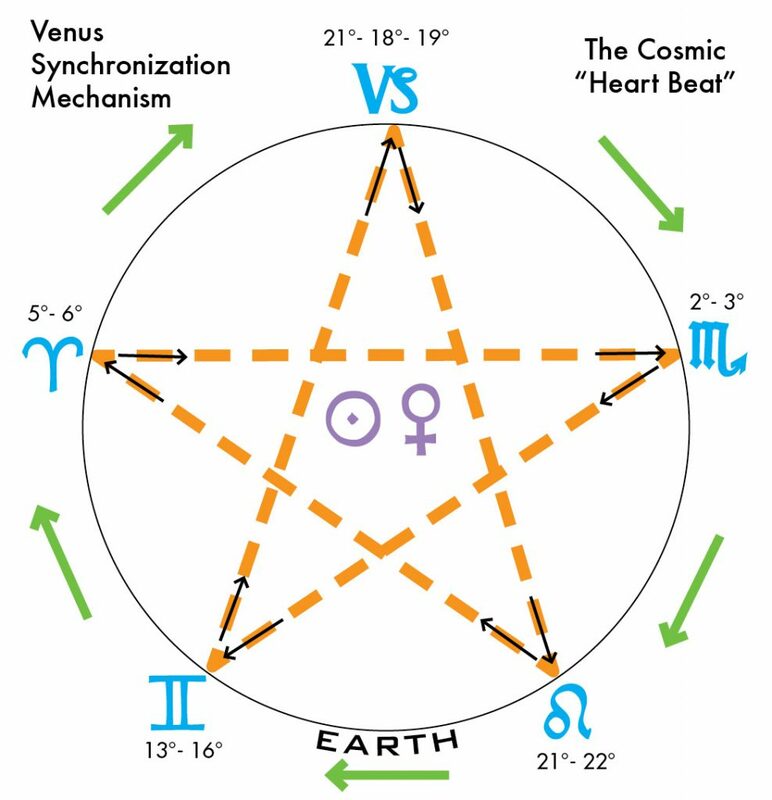 (See Venus Star Rising for a detailed explanation of the mechanics involved in the orbiting Venus Star). From viewing the current pattern of the Venus Star, we see that we are now bringing to a closure and/or renewal the events that were initiated around the Leo Star (August 2015) and setting into motion now the events that will be brought to a conclusion or renewal at the next (Capricorn) Star Point, October 2018. We are also referring back to events from 2013, 2009, 2005 and 2001, the past four Aries Star Points. Count back every four years from now to 1929 and you will have all the Aries Star Points for the past century. The influence of the Aries energy referred to here will be in place all year, until the next Star Point activation in January 2018 in the sign of Capricorn. Capricorn represents the law, and though it may be highly controlling, it is also orderly and doesn’t take well to the brashness of Aries. Those two signs are positioned on the wheel as to be in a constant dynamic state of tension. Take that to mean that the actions of this wild stallion of Aries operating now until January, is either within the law or in violation of the law. What takes place in Aries has its direct reaction or outcome in Capricorn. By the next Star Point (Capricorn) there will be the ruling, the determination and the outcome of present actions to be considered.